Dr. Vivian Ho of Rice University delivers an address in the Hendricks Heritage Room at the University of Houston Law Center. 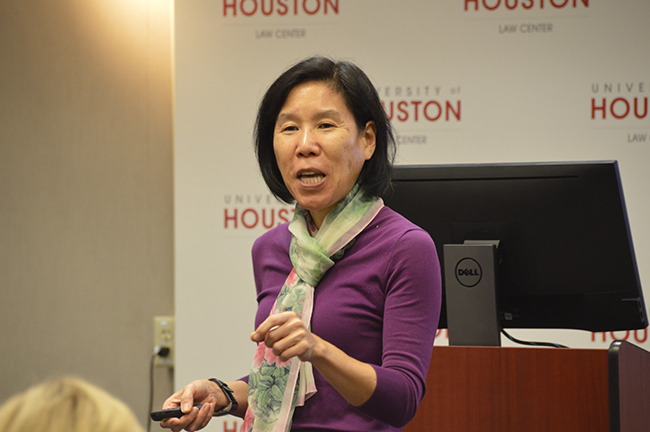 Dec. 8, 2017 — Rice University economics Professor Vivian Ho, Ph.D., discussed what she considers to be dishonest operators of independent emergency room facilities during a recent presentation at the University of Houston Law Center. Ho's lecture, "How are Freestanding Emergency Departments affecting Healthcare Markets?" was part of the Health Law & Policy Institute's 2017-18 speaker series. She cautioned against going to freestanding emergency departments, pointing to a 2015 statistic that the average price in Texas to receive care in a freestanding emergency room is more than $2,000, while an urgent care clinic visit costs about $170. "If you're from Houston, you've probably driven by a free-standing emergency department," Ho said. "These facilities are required to put the word 'emergency' in their titles, but because the facilities are usually in a strip mall many people think it's a retail clinic or urgent care center and mistakenly walk in. "When you compare the prices, the average price is eight to 10 times higher at a free-standing emergency department versus an urgent care center for the most common diagnoses." Ho is the James A. Baker III Institute Chair in Health Economics, director of the Center for Health and Biosciences, a professor in the Department of Economics at Rice University, and a professor in the Department of Medicine at Baylor College of Medicine. Her research on the effect of economic incentives and regulations on the quality and costs of health care is widely published in economics, medical and health service journals. Ho's research has been funded by the National Institutes of Health, the Agency for Healthcare Research and Quality, and the American Cancer Society. Ho has served on the Board of Scientific Counselors for the National Center for Health Statistics, as well as on the NIH Health Services, Outcomes and Delivery study section. She is also a founding and current board member of the American Society for Health Economists and a board member for Community Health Choice. Ho received her A.B. in economics from Harvard University, a graduate diploma in economics from The Australian National University and a Ph.D. in economics from Stanford University.